Update - WeeGo glass bottles by Lifefactory now in adult size! Update – WeeGo glass bottles by Lifefactory now in adult size! If you find yourself looking longingly at your baby’s beautiful Weego bottle and wishing you could have one too, well now you can! 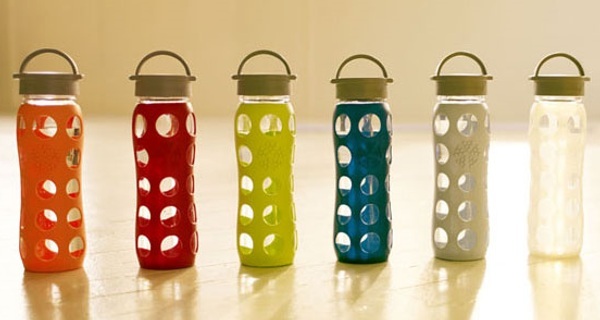 The gorgeous spotty aesthetics of the WeeGo bottles by Lifefactory have always appealed to us at Babyology and so we can hardly contain our excitement to find there’s a new adult size. With a 650ml capacity, it’ll see you through the morning before needing to refill. And when you drink it, you’ll know the water will be as pure as it was when it entered the bottle. The totally dishwasher-safe bottle has a wide mouth so you can add other things such as teabags, ice and slices of citrus. The silicone cover protects the glass, making it an ideal drinking vessel for you while the kids are around. We’ve featured the baby versions of these cute bottles many times and can hardly wait to get our mitts on the bigger ones. The bottles are US$21.99 each through Lifefactory or wait for a local stockist.